Need help? We're available by phone or text, 24/7 at 512-623-7480. The Guild is located in the Gables McKinney Ave Building at 2500 McKinney Ave, 75201. Enter the Guild Entrance located on Fairmount St. (to the left of the Whole Foods Parking Garage entrance). When you get to the Guild Entrance Fairmount St., dial the Arrival Access Number on your phone (number provided via text/email). The concierge will buzz you in to the building. Go to the concierge desk and they will provide you with your registration packet including your access fob and garage remote. You will use the fob during your stay to enter the building, use the elevators, to gain access to the building amenities, and enter your room. Locate the Primary Elevator next to the concierge desk. Use the fob on the scanner inside the elevator. Press your floor level. The first digit of your room number is the floor level (ex: room 833 is going to be on the 8th level). Follow the hall to your room number (lower numbers are closer to the Primary Elevator and higher numbers are at the far end of the hall). Scan your fob on the reader of your door to enter the room. The door will automatically lock behind you. Enjoy your stay! Having trouble? Call 512-623-7480 for help. Parking is available for guests at $20 per night. Register your vehicle by taking this quick survey. The Guild is located within the Gables McKinney Ave Building at 2500 McKinney Ave, 75201. 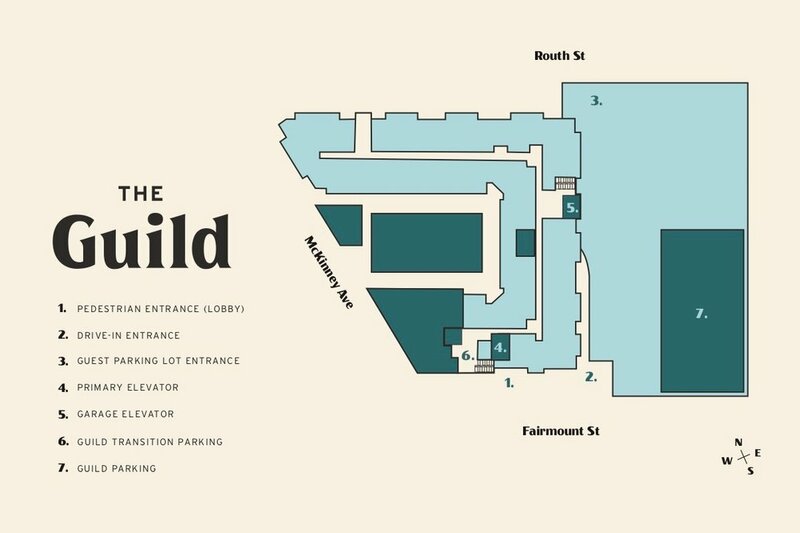 Locate the Whole Foods Garage on Fairmount St. located to the right of the Guild Entrance. Take the down ramp level B1 in the Whole Foods Garage. Follow signage to Leasing Office Parking Spaces next to the Primary Elevator Area. PLEASE NOTE You will have to return to your car after retrieving your key fob so that you can park in the correct garage. Failure to do so may result in being towed. Locate the Leasing Office Primary Elevator vestibule. After 11pm, this door is locked. Please call the Arrival Access Number with your phone (number provided via text/email) and they will buzz you in. Take the Primary Elevator to the Level 1. Go to the concierge desk and they will provide you with your registration packet with the building fob and guest garage remote. Take the Primary Elevator back to parking level B1 in the Whole Foods Garage. 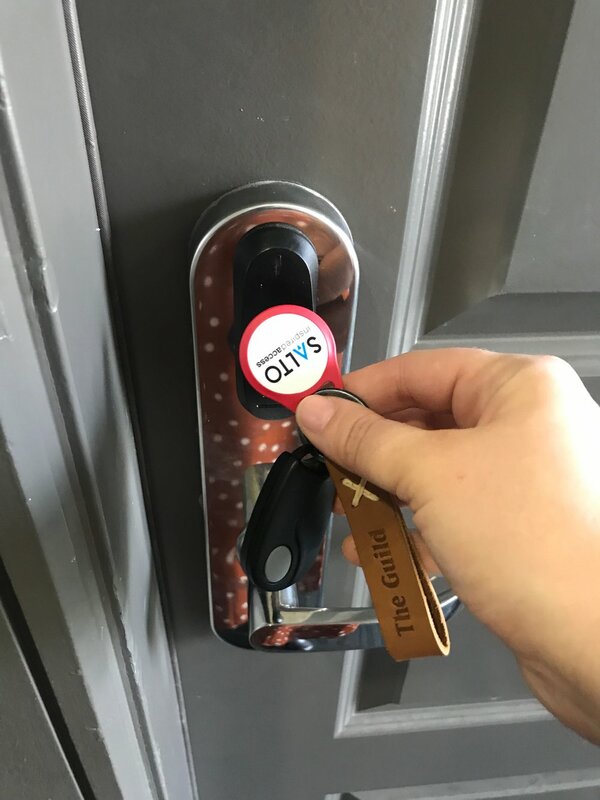 Go back to your car and exit the Whole Foods Parking Garage on Fairmont St.
Go to the Resident/Guest Garage Entrance located on on Routh St.
Use your garage remote to open the gate and follow the garage ramps down to level B3 (the bottom level). Park in any unreserved spot. Locate the Garage Elevators next to the ramp you drove down. To call the Garage Elevators, scan your fob on the callbox in between the elevators and press the up arrow next to the elevator. Inside the elevator, scan your fob on the reader and press your floor level. The first digit of your room number is the floor number (ex: 833 is going to be on the 8th floor). Exit the Garage Elevators and follow the hall to your room number. Lower numbers will be to your left when exiting the Garage Elevators. Higher numbers will be to your right when exiting the Garage Elevators. Scan your room key on the reader of your door. Your door will automatically lock behind you. Enjoy your stay! Use your fob to gain access to all amenities. To enter the pool gates, simple reach over the doors to unlock. To reserve the Media Room, Pool Cabanas, or the Conference Room, please do so with the on-site concierge on Level 1. NOTE: THESE STEPS ARE FOR YOUR FINAL DEPARTURE. If taking a ride share or walking, please take your key fob on to the concierge on Level 1. Access Level 1 via the Primary Elevator. If you are driving, take the key fob with you as you'll need it to access the garage thru the Garage Elevators. Driving? Take the Garage Elevators (located in the middle of the hall on each floor) down to garage Level B3. Be sure you leave your key fob in the silver fob return box directly outside the elevator. The garage gate will open automatically when you drive up. Exit the garage and be on your way! Safe travels & come visit again soon.